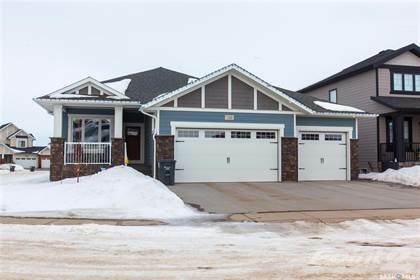 Welcome home to this stunning fully finished bungalow, which was custom built by Campbell Homes. It features a gourmet kitchen with granite counter tops and tile back splash, under counter lighting, gas stove (stainless steel appliances) and in-floor heat. A glass patio door off the dining room leads to a covered deck (composite) with gas BBQ hookup, perfect for entertaining all summer long rain or shine. Additionally the main floor is complete with living room (gas fireplace), 4pc bathroom (jet tub), bedroom and Master bedroom with 4pc ensuite and walk-in closet. The basement is fully finished with family room/games room, large wet bar, 4pc bathroom, 2 bedrooms, utility/laundry room and storage room. Additional items to note: Exterior siding (Hardy-board), 9' ceilings, Hunter Douglas blinds, In-floor heat (Kitchen, master bathroom, basement bathroom), triple attached garage with drive thru (heated and water line), underground sprinklers, central air, central vac RI, and so much more. This home will not disappoint! Hi, I'd like to find out more information about 159 Sinclair CRESCENT. Thanks so much!